Bitcoin is an online system which allows online payments to be made which doesn’t need to have a trusted authority to act as a third-party within the transaction. For example when people want to make a payment to an eBay seller they would use PayPal. The user would make the payment through PayPal which would be sent to the seller in order for them to receive payment for the purchase, in which they would usually add a fee for doing the transaction if you are a business. What makes bitcoin unique is that it is decentralized meaning that nobody controls the bitcoin network and instead uses specialist software to verify the transactions. People are able to send bitcoin anywhere in the world without any authorisation or confirmation from a bank giving people freedom with money without limitations. Another benefit of bitcoin is that it can cut a transaction from 3 working days to within a few minutes which gives business a quicker platform to work from. Bitcoin is able to avoid inflation, with physical money banks are printing money depending on what they need for example to pay off debts while bitcoin prints a certain amount of coins per day which means the more people who get involved with Bitcoin the higher the value of the coin will be meaning that it is a good investment if the users increase over time. It has been said according to bitscan.com that over 31 million transactions as of 10/02/2014 have happened using bitcoin meaning that is still increasingly popular since it first came out in 2008. The negative of bitcoin is the limited amount of places that you can spend it with roughly around 150 online retailers in the UK which accept bitcoin. It has potential to become the go to method of transaction for e-commerce but it has not, in which some individuals is now beginning to feel it has been overhyped. Another negative of the bitcoin service has been when people began to back out of using it after the founding member of bitcoin and CEO of BitInstant exchange was arrested on chargers for laundering money. This in turn meant that big companies such as Apple removed the payment method from their app store. Bitcoin also has the disadvantage of lack of buyer protection meaning that if a company does not provide the customer with the product after a bitcoin payment, then the customer will be unable to ask for a refund or to reverse the transaction due to bitcoin being pretty much ungoverned. There are companies which act as the middle man to prevent this but then this also takes away from the beauty of bitcoin being what it is. One incident which used the bitcoin was Mt.Gox, a company which was based in Japan and was a bitcoin exchange. The company declared ended traded and filed for bankruptcy, and then when the company was being liquidated it became apparent that 850,000 bitcoins were missing with only 200,000 being found. It is believed this was due to many factors such as theft or poor management of the company. Another instance in which an individual had loss money due to Bitcoin was the BitcoinTalk user Allinvain who was one of the first individuals to suffer a major loss of which was 25,000 bitcoins that were taken from his wallet after hackers managed to get onto his computer. End User License Agreement is a license used for software which is a legally binding contract between the manufacturer/author and the user who is purchasing/using the application. 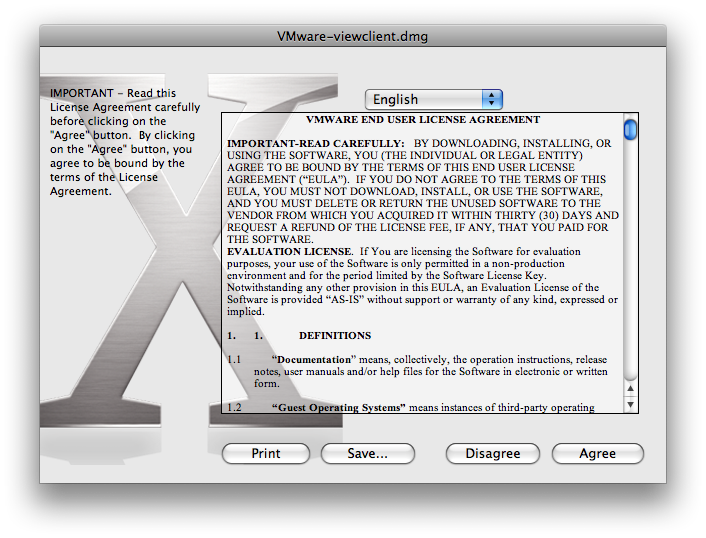 The EULA explains how the software can and can’t be used and any other restrictions that may be in place. This document is not always the same and depending on the agreement will depend on how you agree to the terms. 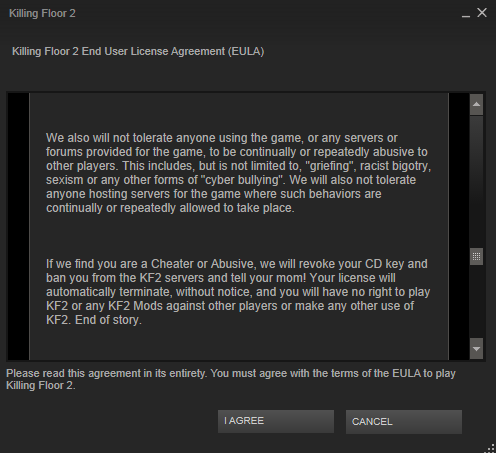 For example agreeing to a game on steam you will have to scroll through the agreement and check the box that you agree with the terms in order for you to start the download. Another example is the possibility of having to email back the agreement that you have signed in order to clarify that you agree to the terms within the document. 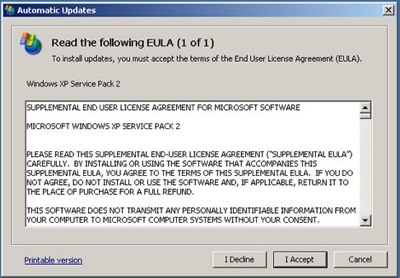 EULA’s are readable once you have downloaded the software so if you do not agree to them and you have purchased the software then you are left basically to ‘take it or leave it’ as a EULA is not negotiable. Brand Guideline Document This is a document which gives restrictions to what someone can do with the brand but also gives way for where creativity can be applied. This means restrictions on sizing, logo changes, fonts etc. Plagiarism This is when someone uses either an image or some text without correctly referencing the original source, thus making the individual to be committing plagiarism. Pipeline A pipeline is a structure in which a company can work in order to achieve the best results. For example an art team could be a part of a big pipeline working alongside others to create a game. Gamification This is when you take game mechanics and apply them in non-game settings for example gamification is used within education to make learning more fun. Avatar An avatar is a digital representation of a person that you have made. People often make avatars based on their personality or how they actually look. Copyright Copyright is when your work is legally protected for a particular number of years so that other individuals can’t use it without asking permission, crediting you and sometimes even having to pay a fee for using it. Grinding This is when a person continuously does something to achieve a goal for example people on Runescape may grind killing monsters to achieve the max level in the quickest time possible to achieve a skill cape. Immersion Immersion is being deeply mentally involved within something for example when you find yourself deeply involved in a book. Indie Game An indie game is a game made by a small company or an individual. Level A level is a section of the game which is distinguished by a start and end point. A level could be an area, a chapter or even a skill. Mechanic This is something which alters the game, such as an interaction. This breaks down into three different types of mechanics; Actions, constraints and conditions. MMORPG This stands for massively multiplayer online role playing game. E.g World of Warcraft, Starcraft, Everquest. Milestone A milestone is a checkpoint that an individual can achieve; this could be a level milestone or even a milestone in a quest. It helps break up big achievements with smaller goals. Narrative Narrative is the story which is given to a game. There are many different types of narrative. Publisher This is someone who sells the game to the general public. There are three types of publishers; mega-publishers, portfolio publishers and single franchise publishers. The one you use will depend on how you want your game to sell. Sandbox Play Sandbox play is basically when the world can be played as the player chooses. The computer can make small decisions but mainly this comes down to the player. Risk This is when something may be difficult and can cause the player to experience some kind of loss for example if the quest is lost then the player must start the quest again. Reward This is something that is given to the play for completing an event or for achieving a goal. User Interface The user interface is what the player interacts with. Unique Selling Point The unique selling point are points which make your game different and unique when comparing against a similar game. AAA games This is a high budget game which has had a lot of promotion. Casual Game A casual game is something that can be played passively and typically appear on mobile and tablet devices. Cinematic This is a scene which is a movie is inserted to break up the game and give the game narrative. Cut Scene This is similar to a cinematic but is made from a software suit such as 3dsmax and have allowed to insert real characters rather than a separate film. Incremental This is something that is repeated on loop yet contains a variable resulting in changed each time. E.g. code. Another example is making small changes in a play test you can change the game slightly and see the different results. Patent A patent is a document which says you are the one who has created your invention and gives you protection encase you need to take legal action. Outsource This is when you hire someone from outside of a company to help you within your project for example IT Staff can be outsourced which would save money rather than have someone In house. Platformer This is a game in which a player gets around the environment usually on platforms at random positions on the screen. Playtest This is testing a game during different parts of a games development to help iron out any bugs or issues that a player may encounter while playing the game. Trademark A trademark is a sign, symbol, word or words which are legally registered to distinguish your goods and services from other businesses. The trademark has to be distinctive and help explain what goods you are trying to sell or the service you are wanting to provide. Flow When skill meets challenge this can invoke flow depending on if that skill and challenge is right for you as a user. Everyone needs different things to reach flow. Reward Schedule The reward schedule is a delivery mechanism in which the player will receive a reward during a particular point in its timeline. E.g. a player is rewarded at the end of a quest. Alpha Map This allows you to create a ‘cut out’ effect using black and white channels. Normal Map This allows you to create bump information on a model. Roughness Map Allows you to make a model appear either shiny or rough. Ambient Occlusion Map This map generates soft shadowing and can be stored as a texture. Active Layer This is the layer that you are currently. Bevels This is something that appears in many software suites and allows you, for example, edit a poly in which it creates a slope on a surface or an edge. Brand This is a logo, symbol, name, saying, images or even colours which help distinguish a particular company. Optimization This is the act of making something fully functional and work as effectively as possible to create the best experience or to get something working as best as it can. LOD Models This stands for level of detail, not all models will use a LOD process but it is good for those models which have a very high polycount which you don’t want a lot of detail seen at a distance. UV Map This is the process of making a 3d model into a 2d surface for you to manipulate usually for textures. Texture This is an image which usually has been altered to go onto a 3d model. Light Map This gives the light information such as the brightness of surfaces to the model. This is all pre-computed and static so that it doesn’t have to be dynamic which would put a lot of pressure on the engine. Shaders This is a bit of software which runs on a graphics card to help the graphics card device how an object should be drawn. Rigging This helps determine the characters skeleton structure so that motion can be added to create an animation and give it life. GUI Graphical User Interface – A visual way of interacting using icons and menus. Archetype A very typical example or an original which has been imitated. Also something that is recurrent e.g. mythological archetypes of good and evil. Bug An error or a flaw in a computer program which causes the software/hardware to act in a unpredictable way. JPEG Known as .JPEG or .JPG, this is a compression file format used for images. MP3 Known as MPEG-1 or MPEG-2 but ends in a .MP3 file format, this is an compression file format used for audio. Stakeholder This is a person who has some connection to an organisation either that be an interest, concern or sometimes helps with the finances of the business. While developing my personal project, I made an attempt to tackle a few blueprints that I needed for my project. I managed to complete a few basic ones myself for example the light switch turning on and off when you walked into a particular area with sound to go with it, I had strings of text appear when you walked into an object and also a menu system which would allow the player to access the game. I made the attempt at tackling harder blueprints but because of my lack of skill and the time it would take to learn blueprint to the standard required I had to outsource that part of my work so that I could achieve the results I wanted. After speaking to Phil he had agreed to help me produce working blueprints within my project which I would have not been able to achieve unless I had found someone to outsource my work. In a professional setting, had this been something that had been work I had intended to sell on or claim as my own and had I been paying Phil for his work, I would have made him sign an NDA to make sure that my work would not be used or sold elsewhere. It would also make him unable to speak about my project to anyone who isn’t stated in the NDA. I would also had him sign an outsourcing contract to say how many hours he would work on the project and the quality and quantity of work I would expect by a particular date. I also tasked myself with working on a small project with a person I had found while looking on the internet for some freelance work. He wanted someone to create 3d models of characters that he had drawn up. I had taken this to the stage of development and began to create the 3d character but sadly had to put the project on hold because of having to finish other projects and not finding enough time without jeopardising quality. Another reason I put the project on hold is because I don’t feel like my skills are developed enough to create that quality of character. Hopefully I will be able to finish this project later on despite it being late. I have spoken to the individual who needed the work and informed him of the other projects I had to complete before this. I wouldn’t have considered this project to be a professional one as no contracts were signed but due to him having the original character design I will have to ask for permission to use the character in a portfolio piece and give him credit where credit is due. Know the project well and be able to answer any questions that may arise – Professionalism is being able to answer any questions correctly in a way the audience will understand or be able to direct someone to the answer to the question such as to another individual in the group or to a particular website. Have a plan set up for who will be taking shifts – This means after every so many hours we swap with other members of the group for example if myself and another individual take a morning shift being 3-4 hours long, then we could swap with another two individuals to give ourselves a break and to give a fresh perspective on presenting the project keeping moods stable and not slacking professionally. Have a plan B for when something doesn’t go to plan – This means have a back up option available for example if someone doesn’t turn up or if a piece of equipment goes down. If we do not consider the worst outcomes then we will not be prepared for them. Be able to communicate with each other effectively – With good communication we can effectively hold discussions with large groups of individuals and be able to allow them to have a turn playing on the project and answer any questions they may have. With bad communication this will affect our professionalism and functionality as a group and this will affect the public’s experience of the project. Be presentable as we will be presenting on behalf of Hull College – This means we need to dress presentably and act as the college would want us to, in a smart, polite and professional manner. Know the audience well and know how to explain things in the correct way for them to understand – This means not overcomplicating conversations with talk of software suites, we only need to be simple and talk about things that will be meaningful for them such as what areas of Whitefriargate we have done, how long it took us and maybe reflect on the era of the project. Visit the location beforehand to know how we can adjust our equipment to suit the rooms style but also to who we may be catering for – If the area is small then we will need to adjust accordingly for example less staff or less equipment, if we have a large area to entertain then we will place more staff and expand our stalls to cater to demand. Have something for the audience to take away with them to remember the event – This gives us a range of things we could distribute to the project such as a hand out with more information about the project, A business card with the project title and website on it. We could maybe reward those who play with the project with things such as a bag of sweets or goodies to give the player a more positive outlook on the project and they will be more likely to talk about the project to their friends and family this way. Less is more, be simple and only say and show what really matters – This means don’t go over the top with presenting, keep it plain and simple so that the audience can enjoy the experience and remember it rather than walk away and forget everything they have been told. Be enthusiastic – If you are not enjoying yourself, then it is highly likely your audience won’t either. Although this is similar to copyright, it stands apart from copyright. Copyright can be used to support this such as detailed information to support the design. Within game industry this kind of support could help protect logo designs and could use copyright to help support it. I find this is a good way to give a designer that little bit more protection on their designs.